With an elegant contemporary style, this single table light features decorative high quality glass body. The lighting resource inside the body and the unique damaged design brings romance, and fashion in to the room. 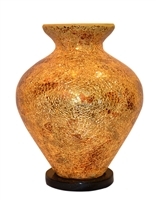 It is great for use in living rooms, dining rooms, kitchens and even hallways. The soft and romantic lights with colorful glasses design will surely stand out in your home. And it will add great elegance and style to any room.